Inventory We are a resale marketplace, not a box office or venue. Ticket prices may exceed face value. This site is not owned by Ovens Auditorium . Ovens Auditorium, located adjacent to Bojangles Coliseum on East Independence Blvd., opened along with the original Coliseum in 1955. The auditorium underwent minor renovations in 2002 that resulted in ADA compliance, better acoustics and an upgrade of the sound system. Ovens Auditorium is an auditorium located adjacent to Bojangles Coliseum in Charlotte, North Carolina. Opened in 1955, Ovens has a seating capacity of 2,455, and has hosted over 7,500 events (as of April 2009). 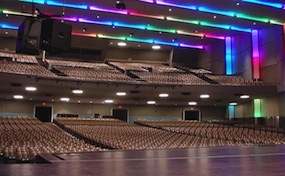 AuditoriumCharlotte.com is not a primary vendor, supplier, or affiliated with any official website. We proudly provide access to a large supply of inventory to secondary market events. Ticket prices may be well below or above face value and will fluctuate with the market. To purchase tickets for all Ovens Auditorium Charlotte Events simply click on the show of interest or call our operators at anytime.